Wear the HUD-route recorder and move your av along the route you want to build. When you are going to change direction, first stop your av and push "save position": actual position will be stored in the recorder. To see what positions are stored in the recorder, push "console" button. your boat or swim params notecard. Clicking on "trash" you will erase all stored points, cleaning the route. The route recorder it is compatible with tl-boat-tour, tl-swim-tour). 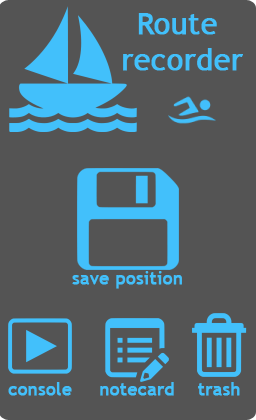 When ready, go near your boat (or swim poseball) and click "GetHUDdata" on boat menu; the route stored in the recorder will be transfered to the boat automatically. NOTE: do not save position from different regions or weird effects could came on resulting route.